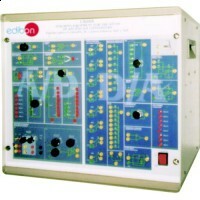 Used for the Study of Analog/Digital and Digital/Analog Converters. It covers the basic principles about analog to digital converters and digital to analog converters, and allows to displaying the results on the computer. hand part for digital to analog conversions. Analog/Digital converter board. Digital/Analog converter board. Signal generator board, with 100 to 330 mF capacitors, 10 to 50K potentiometers and 1 to 100K resistors. Female and male connectors, interconnections. LPF-Low Pass Filter: 2nd order low pass filter, needed to convert analog signals to digital. Adding: this module makes sum of two analog signals. control input defines the operation mode: hold or sample. high level. The gate OR inverts the input IN, to finally give the result of bit operation OUT=S+NOT (IN). Clock: this module generates two digital clocks, CLK1 (245 Hz) and CLK2 (250 kHz). at common pin. Also, pin 1 is connected to common point. In this way, we can select one or other analog signal. Ramp: this module generates a ramp, after reset pulse. A/D control: this module generates the digital commands needed to carry out the A/D practice selected by the PC. (MSB) to Least Significant Bit (LSB), can be controlled by PC. conversion. At this time, PC can read output port, MSB to LSB. Counter: this module is a 8 bit reversible and clocked counter. Waveform generator: this module delivers different voltages needed by unit. everyone with its potentiometer to adjust voltage by 0 to -5.5V for first, and by 0 to 5.5V for second. AC: three different waveform: sine, triangular and square, adjustable in frequency and width. Analog switches: 8 analog switches. All are managed by a PC. D/A: same module than described before “D/A”. Analog input and output for PC. Serial lock 1: module based on an adding inverter, but became an analog memory by included commuting switch. Adding: same module as previously described ”Adding”. Serial lock 2: same module than serial lock 1, but based only on an inverter. R/2R: stair of resistance R/2R. Potentiometer: a single potentiometer, variable from 0 to 10 K .
D/A control: this module generates the digital commands needed to realise D/A practice selected by PC. Operational amplifier: a simple powered operational amplifier. Two capacities of 100nF with common connection. Sample/Hold: same module as previously described “Sample/Hold”. Analog input: Channels= 16 single-ended or 8 differential. Resolution=16 bits, 1 in 65536. Sampling rate up to: 250 KS/s (Kilo samples per second). Input range (V)= 10V. Data transfers=DMA, interrupts, programmed I/0. Number of DMA channels=6. Analog output:Channels=2. Resolution=16 bits, 1 in 65536. Maximum output rate up to: 833 KS/s. Compatible with all actual Windows operating systems. Graphic and intuitive simulation of the process in screen. Compatible with the industry standards. Flexible open and multicontrol software, developed with actual windows graphic systems, acting simultaneously on all process parameters. Management, processing, comparison and storage of data. Sampling velocity up to 250,000 data per second. Comparative analysis of the obtained data, after to the process and modification of the conditions during the process. 4. Cables and Accessories, for normal operation. This unit is supplied with 8 manuals: Required Services, Assembly and Installation, Interface and Control Software, Starting-up, Safety, Maintenance, Calibration &Practices Manuals.